Before I started my own bakery I used to wonder why everyone didn’t just make good cake. It’s not like the high quality recipes that we use at our bakery are some big secret. Sure, we’ve spent years perfecting them, but the basics of making a good cake are readily available to anyone with access to a book store. So why then does every grocery store, local bakery, and even some “higher end” bakeries make the same mediocre product? At first I simply wrote it off to the profit motive. Making good cake (and good frosting especially) takes better ingredients and a hell of a lot more time –all of which translates into more expensive cake and slimmer profit margins. But that answer was hardly satisfying. Sure, you could make this argument for maybe 70% of the cases: the grocery stores, and the big box retailers –but what about everyone else? Imagine for a second you’re a baker. Here’s the situation: You need to make a single piece of food (cake) that is large enough to feed every person at a party. Sometimes there may be up to several hundred people eating this single piece of food, with culinary maturities ranging from scientists and professors to four-year-olds –yet, no matter the situation, this single piece of food must please all comers. Now, add on top of that this piece of food, because of its size and complexity, will need to be prepared over several (usually 3) days. Also, once the cake is stacked and buttercreamed, it will not be seen nor heard from again until it is sliced 24-48 hours later. And if that weren’t enough, this giant piece of food is going to travel up to several hundred miles to be left with a stranger who may or may not properly handle it in the several hours before they may or may not serve it properly or promptly. Finally, after all of this, the cake will be eaten by everyone other than the people responsible for making sure it tasted good. How can you possibly have any semblance of quality control in a situation like that? The truth is that for most bakeries, they simply can’t. Great cake, just like most things of high quality, intricacy and detail, is also incredibly fragile. This fragility applies not only to the physical structure and appearance of the cake, but also to the cake’s taste and texture. 1. 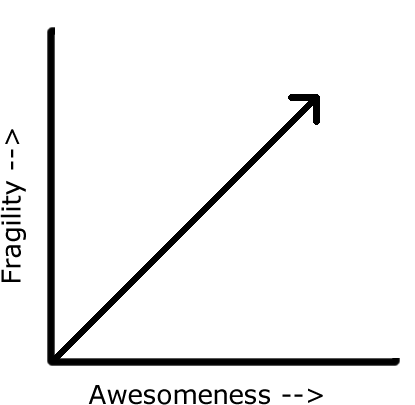 Keep making the absolute best and most uncompromisingly awesome cake you can, while also expecting that there are things out of your control. This is the route that we’ve chosen to take. We make the absolute best looking and tasting cake we can and accept the consequences. Of course this does not mean that we are reckless in our decisions. When we build a cake, it’s going to stand up. And when we bake a cake it’s going to taste good. HOWEVER, what it does mean is that our cakes are not idiot proof. If you don’t transport the cake with care, it will break. 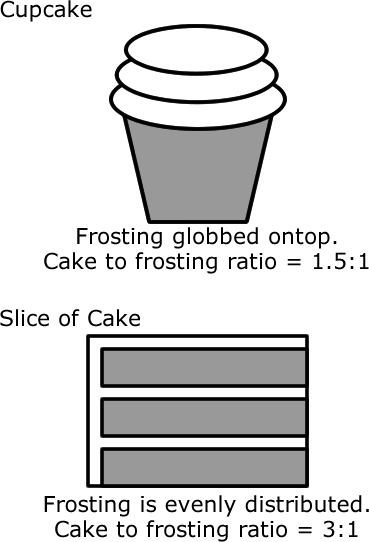 And just as important, if you don’t follow our handling and serving instructions, your cake wont’ taste as good. 2. Put out a mediocre product that your customer can’t screw up. Want your cake to stay moist forever? –>Load it up with oil. Want the buttercream to always stay soft and sweet -even if you refrigerate it? –>Don’t make it with butter. Unfortunately, both of these options are compromises between relying on your customers intelligence to achieve consistency, and watering (oiling) down your product to do the same. For this, and many reasons, we strive harder than any other company I know to educate our customers about what goes into making a good cake, and what the pitfalls may be. What do you mean “Dry” Cake? The most common complaint we (and almost every bakery) gets is that a customer’s cake is “dry”. This is also the most tragic compliant, because, as it is almost entirely devoid of meaning, there’s almost no way for us to know what you’re trying to tell us, or how to take corrective action. You might as well just say that you didn’t like it, because from a troubleshooting standpoint it provides the same degree of detail. This is because the term “dry” is a comparison operator, and often as a customer you have not much to compare it to. “Dry” meaning: I was actually expecting this to taste deep-fat-fried. If you were to compare our cake to a cake that you buy at Costco it will indeed be “dry.” In fact, that’s the entire point. We make high quality food, and one of the traits of high quality food is that it’s not greasy. Greasy food will always be perceived as more moist than well cooked food that has natural moisture (of the H20 variety). Thus, when a customer tells us that they don’t like the cake because it isn’t: gooey, silky, slick, wet, or mushy; what they actually mean is that the cake wasn’t as greasy as they had expected, because none of those words should ever be used to described well-made cake. “Dry” meaning: HAZAH! There is cake in my buttercream! There is another type of customer we’ve encountered is the person who really likes our cupcakes but loathes our cakes. For the longest time we were truly baffled by this complaint. Why on earth would you think that our cupcakes are moist and delicious (which are made from our excess cake batter, have far greater air exposure, and are often on the shelf longer) but complain about the cake being dry? It’s the same stuff as the cupcakes, only fresher! Yet we have almost never gotten a complaint about dry cupcakes, only dry cakes. As it turns out, the difference has nothing to do with cake. People just like frosting, and when they don’t get as much as they want it tastes dry to them. This complaint applies to things beyond bakeries as well. I once saw someone write a bad review about dry BBQ. What? “Dry” meaning: Cold, hard and crumbly. We make our cake with butter. We also make our buttercream with butter. While it seems like a no brainer, very few bakeries do this, and the reason they don’t is because EVERYONE insists on refrigerating their cakes. 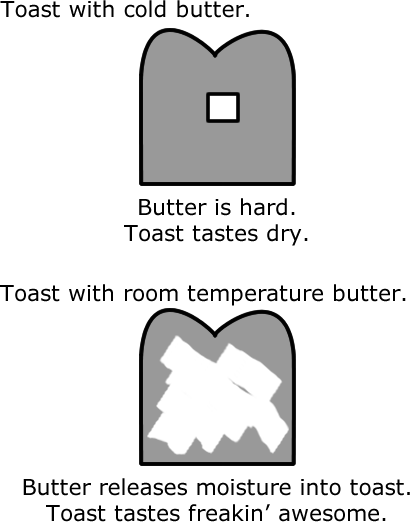 When you refrigerate butter, unlike oil or fat, butter gets hard. When butter gets hard it seals away it’s moisture and all you taste are the dry, floury, grainy parts of your cake. A good way to check if your cake is too cold is if your buttercream is hard. It should be light and whippy, if not just give it more time to come back to room temperature before chowing down. “Dry” meaning: The waitstaff sliced up the cake 3 hours ago. This type of dry is technically known as “stale.” Most people think that staleness is a factor of elapsed time since baking. Despite the numerous “baked fresh daily” signs polluting Dunkin’ Doughnuts coffee shops, time plays no factor in staleness or freshness. Rather, what is actually important is air exposure. Remember that time your kid forgot to retie the bread bag and you found it two hours later completely stale? It was stale because it received A LOT of air exposure in a short time. Similarly, that same loaf of bread, if it sits sealed away in that plastic bag will likely still get just as hard after about 2-3 weeks. In this case the bread has received a little air exposure, but over the corse of a long time. Equal amounts of air exposure = equal amounts of staleness. In fact, if you could create some type of super-duper, evaporation proof, air containment case you could theoretically keep a baked good from never going stale –although it would probably get moldy long before you had the chance to check it for staleness. In any case, once your cake is sliced, you have about 15-30 minutes to stick it in your mouth before it starts getting noticeably stale. If this happens then it’s totally our fault. However, this would never happen, as each layer of cake goes through at least two if not three sets of hands before completion. If it looks, feels, or tastes over-baked, or appears to have gotten too much air exposure, it is thrown out. Also, when we put our cakes together, we cut each layer in half, and trim off the tops. The remnants from every single layer of cake gets tasted as its assembled to make sure that it’s perfect. If not, we re-bake it. “Dry” meaning: THERE ARE NO OTHER MEANINGS. If you think your cake is dry it is because of one of the afore mentioned reasons. You were either disappointed with the fat/oil content, didn’t get enough buttercream (fat content again), ate it cold, had too much air exposure, or it was over baked. Those are the only things. There are no other things. Well, actually, there are a few more things. What it boils down to is fat. When people complain about cake being dry they’re almost always complaining about a lack of fat, or some type of mishandling caused by the constraints of not loading the cake up with fat. But what goes unmentioned is that there is a whole lot more to cake than simply fat. There is flavor, and texture, and structure, and aroma, and beauty. No one ever complains about these other things. They only complain about not getting their fat. Which is sad. Because in response so many bakeries and grocery stores have chosen to just jack up the quantity of fat in their cakes in hopes of alleviating all their problems. This appeases customers, idiot proofs your product, and stops a lot of the complaints, but it also means that all the other things that make cake truly enjoyable get buried beneath gobs of grease, and in the end fewer and fewer people get to enjoy really good cake. If you love good cake you can stop by our storefront anytime and try it for yourself. If you’re too far away you can also check out all of our recipes and even make them for yourself by watching our Howcast baking tutorials! Also, if we’re lucky, this article will be part of our upcoming cake book (more on that to come)! You hit it on the nose. The first time I got this complaint, I was devastated and doubted my product. Dry?! How can my made from scratch & lots of love and praised by friends & family and my loving husband be dry?! I started researching recipes and stumbled on the exact same information. If you are used to a box cake made with lots of fat – you will judge my cake as “dry” and miss the fact that it was delicious and tastes like something your grandmother used to make. Thanks Dani! I believe that Rose Levy Beranbaum wrote something very similar to what you saying in “The Cake Bible” -which is also a good read. I’ll have to check that out. Thanks! BTW – luv your cakes! This is right on the money and thank you so much for this information. Now I can confidently listen and explain to customers if they were to ever complain of my cakes being dry. This is great! Wow, I wasn’t expecting such a great response! Thanks guys! I want to make the cupcakes you demonstrate on Howcast/Aol but the amount of baking powder is never mentioned and I cannot find the recipe printed anywhere. A Joy of Cooking recipe calls for dutch process cocoa and 2 tsp of baking powder but only has 1 1/3 cup of flour. Would a TBS be too much/not enough? Which flavor cupcakes are you referring to? I am completely in love with your blog… particularly this post. I am only sad I just discovered it today. Bless you for being real and awesome! Thank you for posting this. I’m not a professional baker, but I frequently use vintage or family recipes and I have definitely gotten comments about dry cake. It’s a shame we’ve gotten so used to boxed mixes and store cakes that we’ve forgotten what good cake is really like. So excited to find you on Google…..had to search far into the site listings! I’m making my first sculpted b day cake, a dinosaur. I have only seen doctored mix recipes, and I don’t do mixes. Any tips for adjusting pound cake recipe for sculpted birthday cake? Your post of B Day cake of the princess riding the scooter captures my 4 year old grand daughters personality perfectly! She’ll be wearing her Cinderella Gown at her dinosaur themed party. We have a full list of video tutorials to answer your questions at http://learn.oakleafcakes.com/videos Thanks! I CANNOT EXPRESS HOW HAPPY I AM. You have brightened my day. After various complaints of a dry cake – I realize, MY customers dont bake. Any cake they had before mine was probably store bought, or box made. Awful. I now have more confidence in my cakes, and all other products. Fat may be yummy to today’s people. But it is NOT what a scratch cake is all about. © 2019 Blog.OakleafCakes.com – All Rights Reserved.